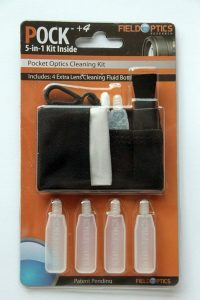 Claimed to be the smallest 5 in 1 lens cleaning kit, the Field Optics POCK pocket optics cleaning kit is a true cleaning kit in miniature. As this is the combo version you get 4 extra lens cleaning solution bottles. This entry was posted in Accessories and tagged field optics, lens cleaning kit. Bookmark the permalink.